Prelude: In 1999 Fox Kids rebroadcast the Beast Wars series alongside the first season of Beast Machines. Hasbro grabbed the opportunity to make some more money with existing molds and reissued several Beast Wars toys in new colors and with the Fox Kids logo prominent on the packaging. One of them was Cheetor, originally solicited as “Mech Tech” Cheetor (one of his prophetic dreams, possibly, foreseeing the Dark of the Moon subline 12 years in the future), who is a redeco of the original Transmetal Cheetor. Seeing as it’s been 13 years since I reviewed that figure, let’s give this another full go. Robot Mode: The idea behind the Transmetals was that their beast modes become fully robotic, while their robot modes inherited the organic qualities of their former beast modes. Case in point Cheetor, who has an organic looking chest plate, complete with spots, that disappears in beast mode. Most of him does look robotic, too, though, and what a great little robot he is. Cheetor adheres to Beast Wars’ great level of articulation and detailing, so absolutely no complaints here. Speaking of detailing, Fox Kids Cheetor is mostly a simple color swap from the original. Grey became red, turquoise became black, and yellow became grey. Unlike most beast formers that transform into four-legged beasts, Cheetor’s arms aren’t the forelegs of the beast mode, but rather form the beast head. Hence his hands are actually the halves of his cheetah head. A strange, but very nice design. In the cartoon Cheetor fired energy bursts by bringing his hands together in front of him. This does work for the toy, too, but only if you unclasp the shoulders. As an additional weapon Cheetor carries his cheetah tail as a combination of whip and blade. Overall I really like this robot mode and it looks very cool in the new colors. Better or worse than the original TM Cheetor? That’s entirely subjective, of course, but I really like this darker design with the red and silver. So two thumbs up for the robot mode. Truly excellent. Alternate Mode: Cheetor still transforms into a robotic cheetah (or rather a generic-looking big cat) with the same color swap as in robot mode. Additionally the chromed golden parts of the original TM Cheetor are still chromed gold, but of a lighter tone. Cheetor retains the excellent articulation of the robot mode. The front legs aren’t quite as poseable as the rear ones, but you can still put the kitty in numerous poses. Sadly the head is immobile, but that’s a result of the design. Like all Transmetals Cheetor has a third mode, a flight mode in his case. He unfolds to jet engines from his torso, giving him short wings. It’s a rather simplistic change, but it works very well, as you end up with a big chromed cat with booster rockets. Strange, weird, and fabulous looking. Pretty much like Beast Wars as a whole. So bottom line for the alternate mode(s): no complaints at all. Great likeness to the TV character (apart from the colors, of course) and just a fun mode. 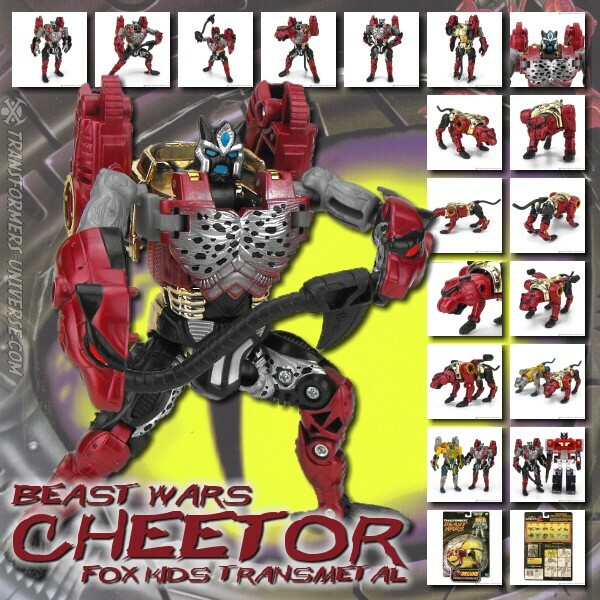 Remarks: Transmetal Cheetor featured prominently in the second and early third season of Beast Wars, but was never shown sporting these particular colors. The figure has since been repurposed, though, to portray the Predacon Cataclysm, a character from the Botcon 2000 comic book “Terminus”, published by 3H Productions. Cataclysm was a herald of Shokaract and was chosen to travel back in time to the Beast Wars Earth to protect the Dark Essence, the life force of Unicron, which Shokaract would eventually absorb to become the all-powerful ruler of the galaxy. Cataclysm failed, though, and was erased from existence together with his master. When I reviewed the original Transmetal Cheetor back in 2005 I have him a straight A rating and I see no reason not to do the same here. TM Cheetor is to me the best Cheetor figure overall, a great likeness to the TV character, and with a simple yet effective gimmick. Just about the only thing I would change regarding this figure is the quality of the chrome paint, seeing as my original TM Cheetor is shedding like crazy and I fear this one will start to do the same sooner or later. Apart from that, though, a brilliant figure, even if it is just a repaint. Recommended to Beast Wars enthusiasts and lovers of good beast-mode Transformers.